The anchorage at Croton Point was very calm and there was only one other boat in the anchorage. The current didn’t turn north until 10:00 so we had a lazy breakfast and weighed anchor to head north. There was no wind so it was motoring all the way. 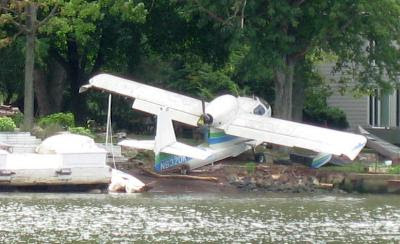 At PYC we occasionally see a seaplane flying low up and down the Hudson in front of our club. Today we saw the plane! It was down just north of the Bear Mountain Bridge, beached by a house. He has his own private airstrip on the river. This edition of the blog now starts an intermission. 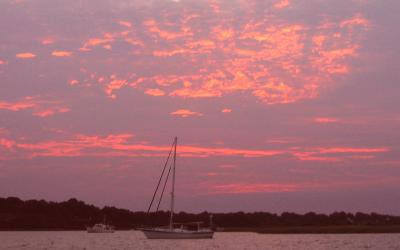 The blog will resume September 15 when we shove off for our cruise down the ICW to Florida for the winter. We have a dock reserved for the month of February in Key West, right downtown. We’ll be home for Christmas but otherwise we’ll be on our boat the rest of the time. You’re all invited to be with us via the blog on our trip south. It’s the first time we’ve made the trip and we are really looking forward to it and sharing our experiences. So mark your calendars for 9/15! The times were not convenient for transiting Hell Gate. If we waited for a favorable tide, we’d face a real slog up the Hudson. So we compromised and left such that we got to Hell Gate with a 2 kt current against at the end of the flood. With that strategy, we had current with us up the Hudson until the Tappan Zee bridge. 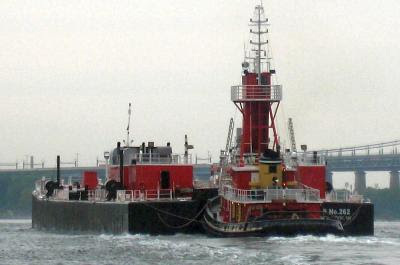 However, we met no less than six tugs with barges in tow going through Hell Gate and the east river. With AIS I knew they were coming and I met one of the bigger ones right under the bridge at Hell Gate. He rounded the turn coming out of the east river and skidded like a sports car driver on a dirt track as he made a right angle turn towards Hell Gate (photo). The skid was right towards me as I crept along the right side of the channel (don't worry, he's turning, even though he's aimed right at me and I have no where to go, isn't he turning? Hard water on the right as tugboat captains would say, finally his bow is no longer pointed at me., whew...). Ann was a little nervous about getting so close to shore and yet I had to give the barge some serious room! Coming into the Hudson we did have our flood tide but then started to encounter a lot of debris and had to be on the lookout in the drizzle, making it hard to see. I thought that with the lack of rain, the river would be clear, not so. We got to Haverstraw too late to use our Cove what with a drain tide and such so we just anchored at Croton Point on the north side since we had a southeast wind. Friday we head north and should get to PYC late in the afternoon. Northport to Manhasset – Bioluminescence at Northport! Last night I forgot to let out the dinghy on the painter so I went out around 9:00 and when the line touched the water, it came alive with flashes of light! I’ve seen a few spots of light here and there before but never like this. Dropping the dinghy line into the water resulted in lights along the entire length of the line. We were on Vieques for a vacation one time and went to their world famous Bioluminescent Bay where the water glowed whenever it was touched. Well, last night Northport bay just to the east of the sand spit was like that. The water was alive with lights whenever it was touched. 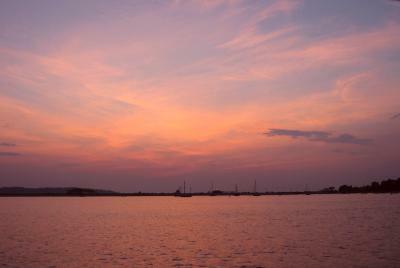 It helped that it was a moonless night and slightly overcast and where we anchored, there were no other lights around. It was beautiful. I’ve never seen the lights in the water like this before except at Vieques and perhaps it was partly due to the warm weather? 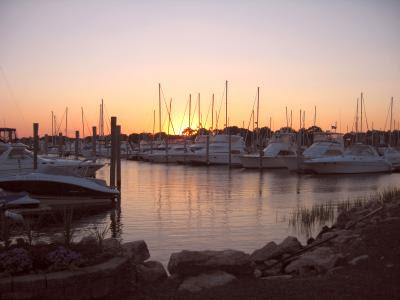 Once again we had no wind and the Sound was glassy smooth so on we motored to Manhasset and took one of the 10 free,yellow moorings put out by the Town of Hempstead. 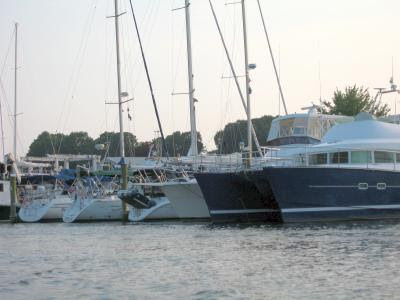 The moorings at a nearby yacht club were $60/day! After we picked up our mooring, we were passed by another member of PYC also on their way back from the Sound, Marty Silverstein. They picked up another of the free moorings and there were still four empty moorings left at the end of the day. Thursday we make the trip through Hell Gate and we’re going to try something a little different. Rather than wait for slack tide to transit Hell Gate and encounter an ebb tide going up the Hudson, we’re going to leave two hours earlier and buck a 2 kt current through Hell Gate so we can start up the Hudson with the current with us for a couple of hours. At least that’s the plan, we’ll see how it works out Thursday. The morning was dead still. Not a breath of wind, the water was glassy calm. To top it off, there was a touch of a drizzle in the air. 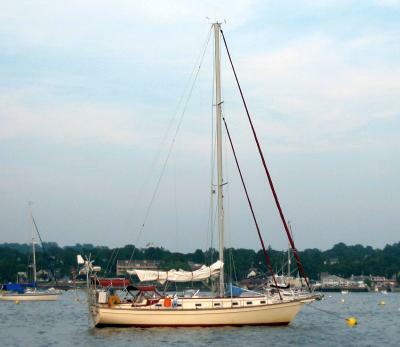 We motored out of Port Jefferson resigned to using the iron genny all the way to Northport. Long Island Sound was like a lake, not a ripple to disturb the mirror-like surface. In due time we reached Northport and found our favorite anchoring spot by turning to port by the first green can beyond the sand spit. Since the water was so calm, I took advantage of the conditions to run a calibration of the autopilot compass. It consists of two slow turns while the autopilot compares the internal compass heading with the GPS and builds a correction table for storage in the autopilot’s memory. The last step is the syncing of the autopilot heading readout with the GPS. With all that done, we’re anchored in 8 ft of water at low tide, all alone in the anchorage – lots of room. We’re headed to Manhasset Wednesday, Haverstraw on Thursday and should be back at PYC Friday afternoon. We’ll spend the night on the boat and off-load Saturday. I have two major tasks to get the boat ready for our ICW trip: first is to replace the radar radome and second is to replace all the hoses in both heads. I really do not look forward to the latter but after 6 years of a lot of use, it’s time. We motored about ½ way before putting up the sails when a breeze finally developed out of the southwest (the direction we were headed, but hey, a breeze is a breeze…) The sun was out, it was warm, no storms – enjoyable. Branford is next to New Haven, a big port and there are many ships usually anchored outside awaiting clearance to come in, one is pictured. Note the position of the life raft at the aft end of the ship, a thrill ride to the ocean from a pretty good height! It helps that they are all on AIS so you can predict crossings when they’re moving, it’s not at all obvious by just looking, especially when they are turning. 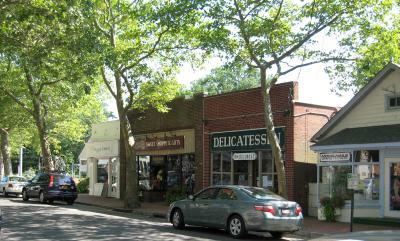 Once into Port Jefferson, we turned west after transiting the entrance and found a good spot, but it didn’t last long. A sailboat with a lone person aboard made an attempt at anchoring and got too close to a powerboat off our port side. He pulled the anchor up after powering forward and running to the bow to haul on the anchor, not easy. On his second try he got too close to us, within a few feet. Once again he powered forward and hauled the anchor up manually. On his third try he got sort of in-between us and the powerboat, close but probably okay. Just for insurance purposes, we always take a photo of boats anchored too close. We probably have to get used to chose anchoring while going south down the ICW. We like to get far away from everybody else when possible to be in our comfort zone. We’ll probably have to develop a new one for the ICW. The great attraction at Bruce and Johnson in Branford is their pool. It’s well kept and the kids love it. They were in the pool for two hours in the morning and for two hours in the afternoon. It also drains a little energy out of the kids (but more out of the adults!) 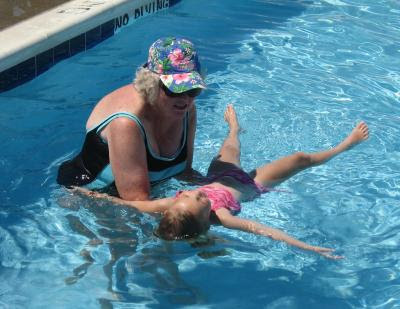 In the photo, Ann is teaching Natalie to float prior to swimming lessons. After all that activity, one has to eat and what better place to fulfill that need than at Lenny’s. We headed out at 5:00 and was seated right away but by 6:00 there was a long line leading out the door and into the parking lot. 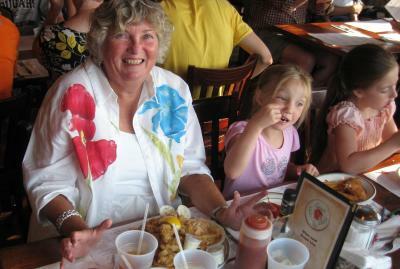 Naturally we had the fried clams with bellies, best on the east coast. Everyone’s left and things are certainly quiet around here, the silence is deafening. 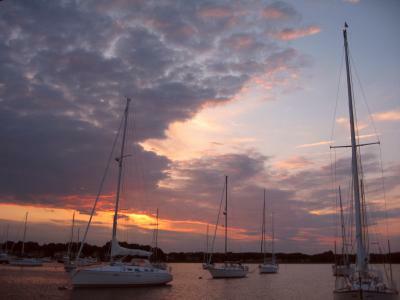 We’ll collapse early to rest up for tomorrow’s sail (we hope!) to Port Jefferson. We awoke to a knock on the door at 4:00 am and found out that a valve on the water pump let go in my son’s house and was flooding the basement. With that, Philip and Monique left to tend to the problem and we had fun with the kids all day which included two trips to the pool and a ride around the Branford area in the dinghy. 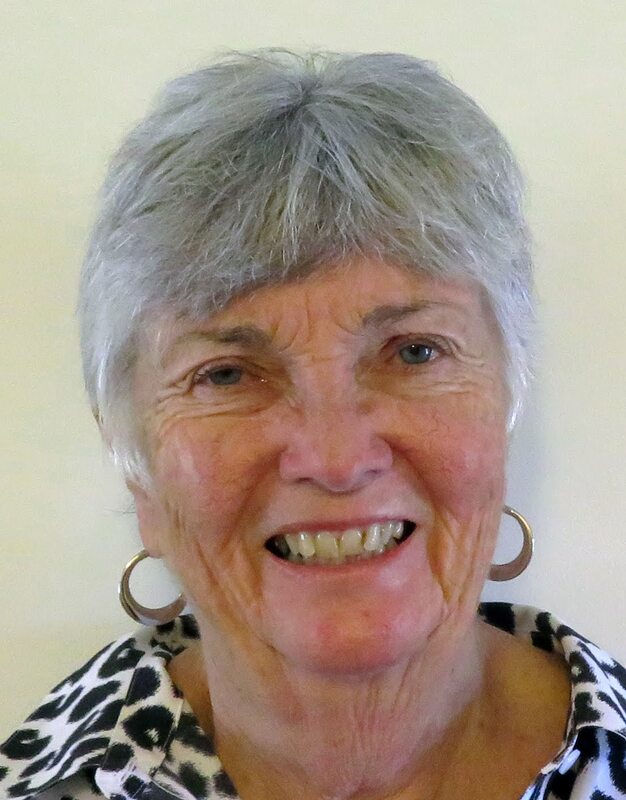 Boy are we beat, running around with kids can do that to you – did we ever have that much energy? Of course the problem happened on a Friday night when the insurance company was closed and on a weekend when they were away. However, they have USAA insurance which is one of the best. The office was closed but you can report a claim on their website. Within an hour of the internet submission, a truck pulled up with drying equipment and went to work! The rug was removed, fans and dehumidifiers were installed and the floor cleaned. What service. I had a similar experience with USAA when I was rear-ended on a Friday afternoon. I entered the information into the USAA website and was scheduled an appointment the next morning at 9:00 am on a Saturday with a repair shop. When I showed up, he was expecting me and I was taken care of on the spot. All this is a digression from my usual blog post but I thought it was interesting that some companies still believe in customer service first. The great weather continues and we have decided to stay another day so Philip and Monique can get some rest and enjoy a night out at Lenny’s on Sunday. It’s a good deal since Bruce & Johnston gives a 25% discount after the first stay during the year and a 5% discount on fuel. With the great pool and Lenny’s nearby, it’s hard to beat. We were going to sail to Port Jefferson today but got lazy and just stayed an extra day since we’re going to meet Philip and kids in Branford on Friday for the weekend. It reached 95 in the afternoon so we had the A/C running all day. 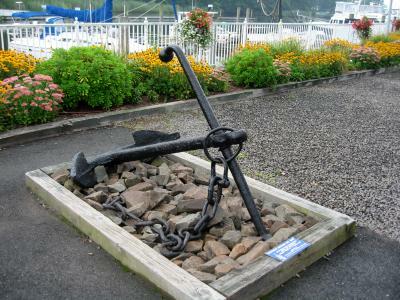 I went for a walk and found an anchor on display at the marina that had been found nearby. 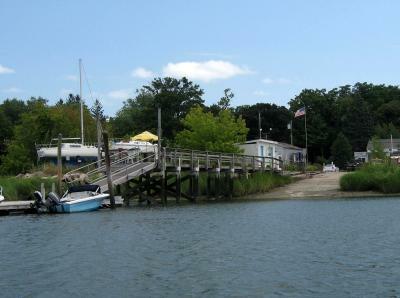 It looked very similar to the anchor that’s Poughkeepsie Yacht Club has by the clubhouse. Ours was found in the anchorage area just north of the club. I wonder if it’s the same make? In addition to an excellent Mexican restaurant in Milford, there’s also an excellent ice cream shop that must have about 50 varieties so we had to try that after dinner on the boat. Try it if you’re in the area, it’s right behind the Milford Landing marina. You can see that we’re tucked in and the marina is very well protected, no wakes, no waves. We had storms all around us today but none came through Milford except for some early morning showers. Friday it’s off to Branford for some pool time with kids. 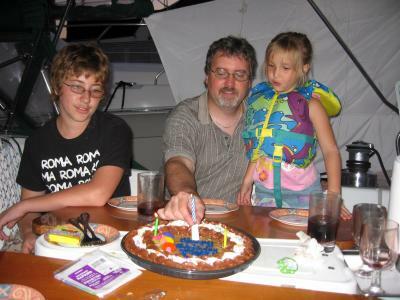 We sailed about ½ the way with a light wind but then it died in the middle of the Sound (again!) so it was back to the iron genny. The morning lies said the wind was supposed to be 10 to 15 kts out of the southwest – as usual NOAA was wrong. Not only did they get the speed wrong but also the direction, it wound up out of the northwest, not southwest. 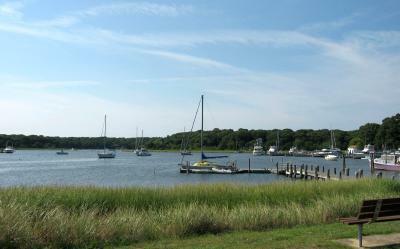 We docked at Milford Town Landing, our favorite spot in Milford. They had plenty of dock space left. One boat came in later that took the width of two docks! 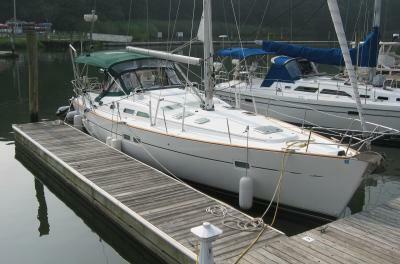 It was made by a catamaran company and looked just like a cat but without the sails. It’s at the far left in the photo with two hulls. It’s enormous, a real floating condo. I wonder if he has to pay for two docks? With our dockage, we also get a 10% discount at Cabo’s which used to be Cancon Charlie’s’. It’s a Mexican restaurant that serves very fine Margaritas along with good Mexican food. After that we took a ride around the harbor and was amazed at the number of boats tucked in here. I would guess at least 500 boats. It’s a small harbor but they use the space very efficiently. Some people have asked why I take so many sunset pictures. Well, Ann and I have never had a house with a view of the sunset. We’ve always been situated facing north or else in an area where we can’t see the horizon due to nearby trees or hills. So the only time we get to see sunsets other than at PYC is when we’re cruising so we enjoy every one. We left Mattituck at 7:00 am to catch the tide, it was plus 4 ft over low when we left. Even with that, we came across one spot where the depth sounder read 8.5 ft just beyond the anchorage. The forecast was for strong winds of 15 to 20 kts with gusts to 25 kts in the afternoon so we made good time to Port Jefferson before the small craft advisory took effect at 2:00 pm. It’s a Tuesday night so there’s only three boats anchored here, a far cry from the two dozen anchored over the 4th of July weekend. We like PJ for the good holding ground and a good place for Hoolie relief nearby. There’s a marina you can dink to for ice (photo) and public dock if you want to walk into town. There’s an excellent butcher shop and a good fish store not far away. The dink ride is into the bay to the west of the main harbor, not downtown. As I write this, it’s still gusting to 20 kts! Hopefully, it quiets down later tonight. Wednesday it’s off to Milford. Strange sunset, no sun but the clouds lit up. Leaving North Cove we stayed more in the middle of the channel and the lowest we saw was 10 feet at low tide. But, you have to pay attention to staying in the middle to take advantage of the 10 feet. It drops off on either side to 7 feet pretty quickly. There wasn’t much wind at first so we motored about ½ way went slow since we didn’t want to arrive at Mattituck before 2:00 so we would have a 3 foot tide to help us over the low spots. After a bit the wind picked up and we sailed the last third of the way. Furling up the sails (roller furling is really nice! ), we started our approach with eyes watching the depth sounder and the buoys. Corrected for the 3 foot tide, we saw 7 feet at the entrance over the bar. You could mostly see the low spots and it averaged about 8 feet the rest of the way until the last turn for the anchorage where we saw 5.5 feet for about 100 yards (corrected to low tide). 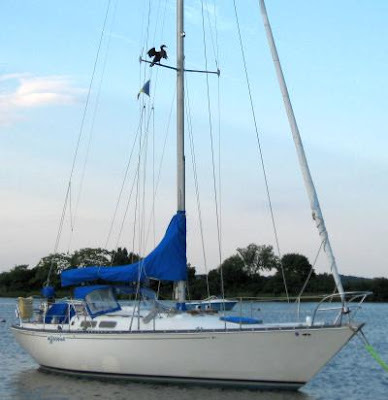 The anchorage itself is marked with anchoring buoys and is 7 feet at low tide with good holding ground. Town is only two blocks from the anchorage and has one of everything (hardware store, small grocery store, cheese shop (excellent selection! ), Deli, Chocolate shop, restaurant, ATM and a few others. It’s very well kept. High tide tomorrow is at 5:30 am and then it starts falling. With that we’ll get an early start, I want a little insurance under the keel on the way out! 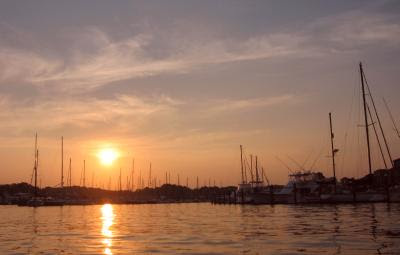 A 7:00 am start will still give us about 4 feet of tide, then it’s on to Port Jefferson. We’re watching the tropical storm that’s developing down south but so far it’s not projected to be a hurricane. Needless to say, we’ll keep a close eye on it. We liked it so much we decided to stay another day. I did some exciting stuff like teak work and sanitizing two heads, such fun. I found out that when the dealer installed the macerators and associated plumbing, he did not use sanitation level hose (it has an odor barrier) but used instead the much cheaper bilge type hose. Needless to say, it is odoriferous. His entire installation left much to be desired and I’m planning a redo, ugh! The above tasks occupies most of the day but it was very pleasant with temps in the low 80’s and low humidity. Ann baked a chicken in the Dutch oven which hit the spot. We admired the cormorant sitting on the spreader of the boat next to us. I imagine the owner will likewise “admire” what lies below his perch. He liked his perch, he came back to the exact same spot throughout the day. We’re headed to Mattituck on Monday if the weather is good. Nice sunset.